So here we are on another round of Whole30. I’ve never been a black coffee girl, probably since I don’t really “do” caffeine but I do like having a warm cup of something in the mornings. Usually it’s my own Smith-Style Bulletproof Coffee concoction that you can find HERE but when I’m on a Whole30 the maple syrup is out. So I’m left with coffee and coconut oil which I’m not all that crazy for. Enter clean / Whole30 compliant almond milk from the New Barn. In my book, it’s a game changer. On all levels. Not only is it clean of all of the junky thickeners and additives that most other brands use, it simply tastes so much better. It tastes like, well, it tastes like almond milk. What almond milk is SUPPOSED to taste like. Make sure to use their UNSWEETENED version though as that is the version that is compliant. Yes, you can make your own almond milk but I make enough of my own stuff already and don’t need to add more to that list. 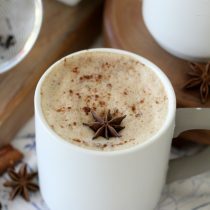 Feel free to add some cinnamon to this tasty treat too. No way! That is fantastic! Where is your coffee shop located? 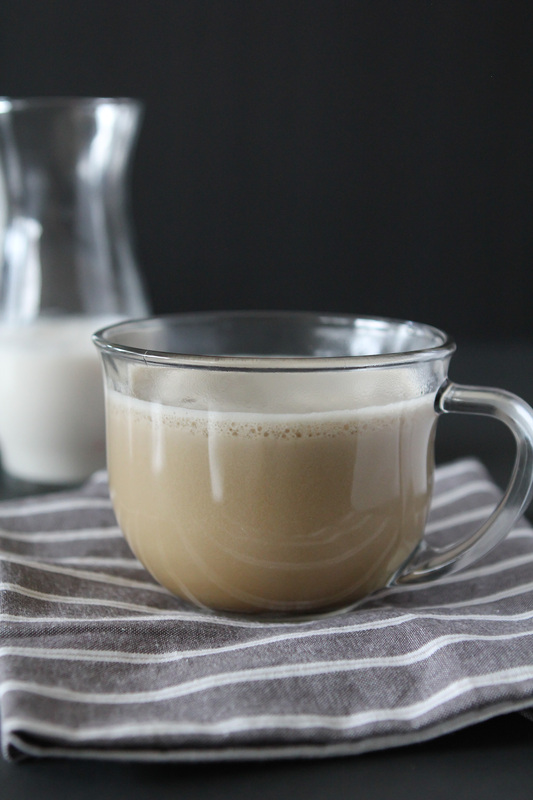 I had made bulletproof coffee a few times prior to whole30 with coconut oil and butter but never really loved it. Since starting whole30 I’d been drinking my coffee black or with just a splash of almond milk, but your recipe made me decide to mix it up. 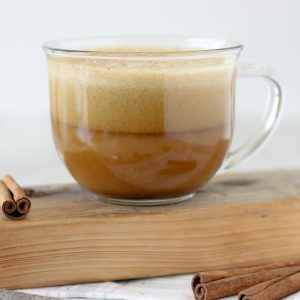 This morning I used coffee, coconut oil, Califia almond milk, a bit of clarified butter, and a sprinkle of cinnamon – I don’t have an immersion blender so I used a food processor – and Holy. Cow. It is so good. Thank you! I thought maple syrup and acacia gum were not allowed on the Whole30. They aren’t! But New Barn has an unsweetened version that’s compliant! Can I substitute something else for coconut oil? This was delicious!!! I am new to this whole coconut oil thing, what’s the benefits of putting it in your coffee other than its delicious? You are just the best! I love this and need to try it out ASAP. Our team is always throwing back espresso shots in our kitchen on the weekends so I think I’m going to have to introduce the WholeSmiths Whole30 Latte next weekend. Thanks for always sharing such wonderful stuff! Very good just tried! Silly question, but the almond milk cools it off a bit so I had to nuke it to warm it back up. Do you warm the almond mil ahead of mixing? Being a half and half + Sweet leaf girl before whole 30, this is going to help tremendously! Hey! 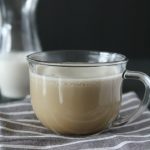 I’ve been following you on Instagram for awhile and knew you’d be a great resource for a Whole30 coffee drink. 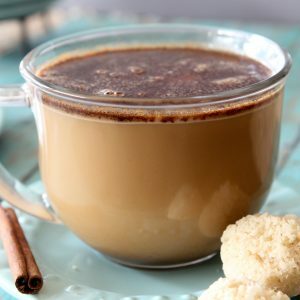 I used your recipe above as the jumping off point for my coffee drink. I don’t have clean almond milk, and haven’t made my own batch yet, so I used some of my Nutpods French Vanilla non-dairy creamer. IT FROTHS LIKE A REAL LATTE! I’m ECSTATIC to have found a coffee drink that a) needs no sweetener for me to drink it and b) resembles a coffeehouse bev I can make at home. I knew I was going to miss my Bulletproof-type coffee drink on the Whole30 but this is the PERFECT replacement. THANK YOU!!! Tried this for the first time. Not totally on board yet. Not sure I like the oiliness of it. I will try again with hopes of liking it better. I’m thinking I need a smaller cup (made a full cup) so the ratio might be better. You can try cutting the oil in half also. Does the coconut oil really taste good in this or is it just for the health benefits? Just tried for the very first time. Excellent! I feel super full. Have you ever added protein to this? Yes! It’s delicious like that too! Yum!!! I used coconut butter instead of oil and it’s delicious!!!! I’m hoping one big glass of this will replace my 3 usual cups of coffee and curb the jitters!! Do you warm the almond milk first?